20-25 May, 1940. Faced with the choice of evacuation or total destruction of the BEF, the evacuation from Dunkirk begins. Spitfires join the air battle. On 20 May the armoured spearheads of the German Army Group A reached the Channel coast at Abeville, concluding their exemplary push through northern France initiated in the Ardennes only ten days previously. The exhausted British Expeditionary Force, Belgian Army along with elements of the French 1st Army found themselves completely surrounded by the Army Group A from the west and Army Group B advancing through Belgium to the east. After reaching the Channel the Germans turned north along the coast, threatening to capture the ports and annihilate the British and French forces in a rapidly decreasing perimeter. Faced with the choice of evacuation or total destruction of the British Expeditionary Force, the Admiralty went about in record time to plan and organize naval rescue operation under the command of Vice Admiral Bertram Ramsay. In nine days more than 300,000 soldiers were to be evacuated from the only remaining harbor at Dunkirk and the surrounding beaches. Much of the work, especially towards the end of the period was done by “Little Ships of Dunkirk”, a hastily but very effectively assembled fleet of civilian merchant and fishing boats, fire ships, paddle steamers, private yachts and motorboats, barges and RNLI lifeboats. For the time of the evacuation, harbor facilities and the surrounding beaches crowded by troops awaiting evacuation became obvious primary targets for the Luftwaffe. However, due to the rapid advance of the army their bases were now far behind the front. The Stuka and Bf 109 units had to move forward to operate effectively over the Dunkirk area and the transfer started with I/JG 27 which arrived at St. Omer on 24 May. The movement gave the RAF a few days of much needed respite to provide aerial cover for the evacuation. Dunkirk was within range of the fighters operating from southern England, and 15 out of 19 available Spitfire squadrons, previously held in reserve, were sent into the battle. Arguably the first victory by Spitfires over Dunkirk occurred on 21 May when Sqn/Ldr James Leathart, leading No. 54 Squadron engaged a Heinkel He 111. He was awarded one aircraft probably destroyed. An interesting engagement took place on May 23. A Miles Magister two-seat trainer escorted by two Spitfires was dispatched to retrieve C/O of No. 74 Squadron who had made a forced landing in Calais-Marck. The trainer aircraft was attacked by twelve Messerschmitt 109s whilst taking off at Calais. The two Spitfires atacked the Germans, shooting down two and protecting the Magister. These were the first aerial victories of Plt/Off Alan Deere. Three days later, with 6 enemy fighters to his credit, Deere became the first RAF Spitfire pilot to achieve ace status. Good luck belonged that day also to the pilots of No. 92 Squadron. This unit, having only recently converted from Blenheims to Spitfires, flew its first mission over Dunkirk on 23 May. Over Picardy the squadron engaged a formation of six Bf 109s, claiming four of them destroyed to the loss of one own aircraft. Later the same day, the squadron took off again only to encounter a large formation of Bf 110s over the French coast. In the resulting melee, Spitfire pilots claimed no less than 17 German aircraft destroyed, but lost their commanding officer Sqn/Ldr Roger Bushell who had to bail out and was taken prisoner. So impressive victory, however, never happened. Almost certainly, both encounters were examples of massive overclaims by inexperienced RAF pilots. Another problem of the day were the insufficient aircraft recognition skills among the pilots. In one documented incident, No. 806 Squadron FAA operating Skuas over Dunkirk on May 28 had one aircraft shot down into the sea and another badly damaged by RAF Spitfires. Despite this, it is beyond doubt that Spitfire units immediately put up hard opposition to the Luftwaffe over Dunkirk. 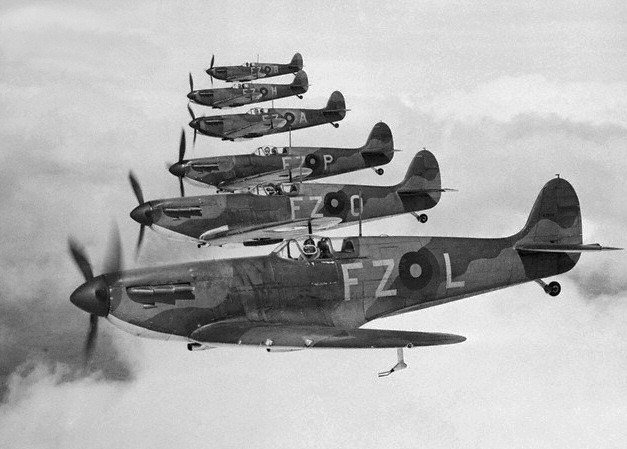 The first large aerial battle in which the Spitfire took part opened favourably for the RAF. The success continued on 25 May when No. 92 Squadron on patrol over Calais sighterd and attacked a formation of Junkers Ju 87s escorted by Messerschmitt Bf 110. Seven of the German twin-engine fighters were claimed destroyed. One of them fell victim to the new RAF ace F/Lt Robert Stanford Tuck, commanding one of the flights of of No. 92 Squadron. In only three days, Tuck shot down six aircraft over Dunkirk, a feat for which he was later awarded a Distinguished Flying Cross. Tuck was a quick learner and skillful tactician, and was one of the first advocates of revising the offically adopted RAF fighter tactics to the new conditions of the battlefield. On the following day, Guderian’s XIX Army Corps reported “Very heavy activity by enemy fighters. Own fighter cover completely lacking. Luftwaffe operations against enemy sea transport remain ineffective”. At the time Ramsay’s evacuation of troops was already underway. The photo above of Spitfires flying line abreast shows, closest to the camera, Spitfire Mk I of 65 Sqn RAF, flying out of Hornchurch bearing squadron letters FZ-L, serial number K9906. Taken in 1939, the pilot was Robert Stanford Tuck. He flew Spitfires with 65 Squadron during the Battle of Britain until promotion to Squadron Leader to command a Hurricane squadron. In August 1941, then with 27 victories and a Wing Commander, he was shot down by flak and was later sent to Stalag Luft III and was present at the time of the Great Escape, March 24-25 1944, master-minded by Squadron Leader Roger Bushell, Big X, who was shot down over Dunkirk on May 23, 1940. Bushell was executed by the Gestapo after recapture. Robert Stanford Tuck retired from the RAF post-war.